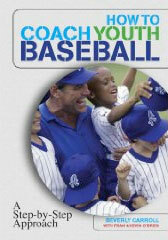 CO-AUTHOR OF "HOW TO COACH YOUTH BASEBALL"
MASTER'S THESIS: "COACHING FOR THINKING AND LIFE SKILLS"
This clinic is designed for the coaches of Youth Baseball Programs in Little League, Babe Ruth and Cal Ripken, among others, who bring great excitement and enthusiasm to coaching kids but need the tools to teach the game properly. Our clinic will energize your coaches by showing them simple and time-proven techniques to help teach the fundamentals of the game that coaches can then share with their players. This results in more enthusiastic, efficient and productive practices for coaches and improved performance of the players. Volunteer coaches with great energy and positive intentions will benefit from experiencing time proven expertise to help make the youth baseball experience a positive one for all. Teaching the game properly will make coaching fun and more importantly benefit the young players under their leadership. $299 FOR 2 HOUR CLINIC: THAT IS LESS THAN $10.00 PER COACH BASED ON 30! DON'T LEAVE THE FUTURE SUCCESS OF YOUR PLAYERS TO CHANCE. PUT YOUR COACHES IN A POSITION TO TEACH THE GAME PROPERLY. THE RESULTS WILL AMAZE YOU!. (508) 588 0772 or email us. "Kevin O'Brien brings an excitement that is truly contagious and inspiring. The energy that he brought to the clinic was amazing. All of the participants came out feeling good about what we learned and how to teach it. He filled in all the holes in what we thought we knew and broke it down into teachable examples and drills. Even someone like myself who'd been coaching children for over 30 years was truly inspired and re-energized and frankly, I learned more than I care to admit. We are seeing the results in the children that we teach in less than a year. Truly an amazing man!"